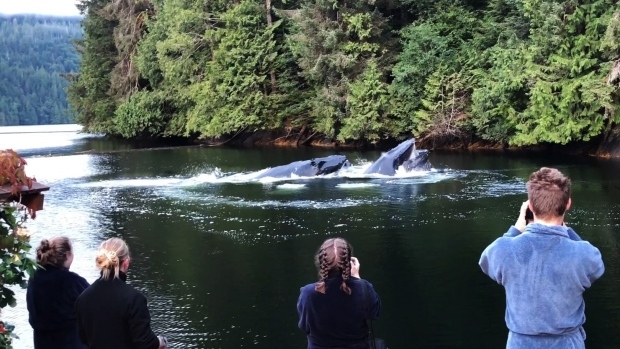 Humpback whales entertain visitors to Great Bear Lodge in Port Hardy, B.C. in this still frame from a handout video. THE CANADIAN PRESS/HO, Marg Leehane. PORT HARDY, B.C. 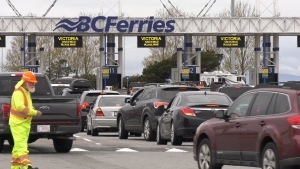 - Tourists staying at a lodge on a Vancouver Island were treated to a spectacular show when a group of humpback whales visited for breakfast. She says she's never seen whales so close to the lodge, and until last year she'd never seen humpbacks in the area use the bubble-netting technique to catch fish. “One of them will swim in a circle around fish, and as it's doing it, it will release air from its blowhole, and basically create a net of bubbles,” she says. “I love watching her body language as much as the whales, because she's so excited to see it,” laughs Leehane.